Advanced Applied STEM Academy Students Learn by Doing - PBL allows students to learn by doing as they work though a number of directed problems and projects. Advanced Applied STEM Academy Students Learn to Present - Throughout the curriculum, students lead class presentations on concepts such as systems, technical communications, and ethics. They defend their solutions in front of their peers. 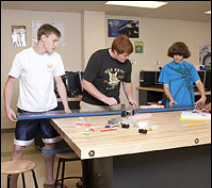 Advanced Applied STEM Academy Students Solve Real-World Design Briefs & Case Studies - PBL allows students to solve realistic engineering problems with hands-on projects. Both design briefs and case studies motivate students to think critically while developing their own unique solutions. STEM Learning Systems provide engaging hands-on STEM education programs for Elementary, Middle & High Schools that focus on building 21st century skills including: problem solving, teamwork, initiative, self-direction, and career development. "The students that have gone through our Action Labs, come to the high schools with the ability to think quicker, to solve problems, and to engage in conversations about the content." This course is an exploratory course featuring design based problem solving and academic concepts in modules including Alternative Energy, Environmental Technology, Robotics and Transportation. A high-energy multimedia format takes student involvement to an even higher level. Students will use Paxton/Patterson’s CAREERplus Integrated Instructional Units to explore open-ended problems and imagine solutions. Additional whole class learning experiences focus on learning the basic characteristics of technology and design. Students will use this course as a foundation before moving on to the more rigorous, upper-level technology and engineering courses. This course is designed specifically for students entering the Advanced Applied STEM Academy Initiative at Northside High School. Students are better prepared for post-secondary success because they have identified their strongest skill set and pathway. Even students who do not plan to pursue engineering after high school have highly transferable problem-solving, communication and collaboration skills that are relevant for any career or coursework. The problem of insufficient resources challenges scientists to look beyond fossil fuels for energy to power the world. Using a variety of energy production and experimentation equipment including wind power, the Sterling engine, PEM fuel cell, and a photovoltaic array, students explore current technologies in alternate energy as well as the future applications of hydrogen fuel and biomass. Defining the effects of technology’s impact on water, land and air quality is the primary mission of this exploration into environmental management. Students use professional quality water and air sampling apparatus and perform a variety of particulate and chemical tests. They use the unique water table and earth strata simulator to investigate the effects of pollution on ground water. Students use two computer controlled robots and a fluid power/pneumatics trainer to emulate industrial processes. They'll see how the electronic and mechanical components of robots function. They'll gain an understanding of sensors and programming methods used in robotics while conducting a series of robotic experiments. Transportation technology is the systematic movement of people and goods and its effect on society. Each system, land, sea, and air, is a group of micro-systems working together for efficiency and effectiveness. Student teams design a maglev train, use a buoyancy tank to test scale hull designs, and investigate the characteristics of wing sections in the wind tunnel. They use an aeronautics trainer to chart and execute flight operations. This course continues and expands on technology concepts from Foundations of Technology and Engineering A. Technology labs in this course increase in difficulty and are foundational for preparing students to succeed in Applications of Engineering and Technology, a more rigorous, upper-level technology and engineering course. 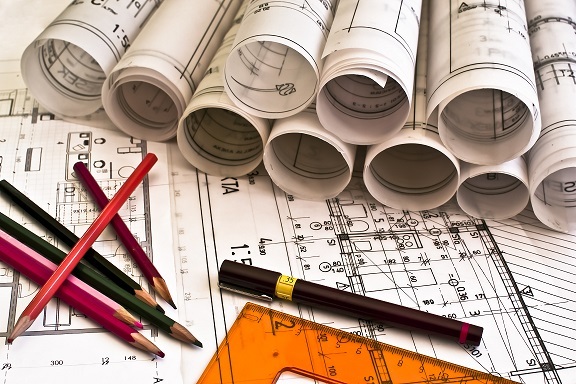 Labs and activities in Foundations B explore the technologies related to current fields of engineering, including: Architectural Design, Construction Technology, Manufacturing, and Material Science. Emphasis will be placed on learning to research and present information directly related to their technology based studies through capstone projects, authentic design briefs, and Solidworks® 3-D Training. This course and SkillsUSA technical and leadership activities enhance the skills of students interested in pursuing technical, engineering, or science related careers. This course is designed specifically for students entering the Advanced Applied STEM Academy Initiative at Northside High School. Students become aware of the decisions architects make each day with regard to materials, their application to the site, and their visual appeal. They work through a series of design exercises and team projects in a professional architectural environment. Architectural form modeling, combined with the use of CAD software, provide an opportunity for genuine design activities. Students explore construction systems including framing, HVAC, electrical, plumbing, and plot planning. Construction mathematics is emphasized using a transit and a laser level. In this Unit students understand systems thinking, and the integration of materials, labor, costs, and site management in every phase of building. Manufacturing and production technology is a conscious exploration of the processes that take raw materials to finished goods. Student teams take their designs from concept sketches to finished products while defining the systems structure of a manufacturing enterprise. Their manufacturing process activities will use CNC equipment, plastics mold design and rapid prototyping. This IIU provides students with the opportunity to create new products of their own design. Students develop an understanding of the materials and processes used to create the products they encounter every day. They’ll use, test, and process natural and synthetic materials like plastics, metals, wood composites and textiles. Using the Paxton TSB 5000 Materials Tester and other technical apparatus, student teams will explore the properties of raw and processed materials. Our capstone program takes students through a rigorous 180-day STEM program with an emphasis on engineering. Programs place students in a virtual internship, working for an engineering consulting firm. Student teams are engaged in authentic engineering work, solving real-world problems and competing to win professional contracts. Designed with the express purpose of being inclusive so all students, not just the academically gifted, would have an opportunity to experience STEM learning. The combination of the CAREERplus Foundations program and the CAREERplus2 Application program enables students of various abilities to participate in a rigorous course. Engineering design, inquiry, and learning-by-doing help students connect the STEM dots -- changing the way students see the world and helping them find their pathways in it. This course places collaborative teams of students in a virtual internship, working for an engineering consulting firm. Student teams are engaged in authentic engineering work, solving real-world problems and competing to win professional contracts. Student teams gain spatial reasoning through work-themed authentic engineering practicum in four rigorous modules: Alternative Energy & Environment, Architecture & Construction, Manufacturing & Materials, and Robotics. 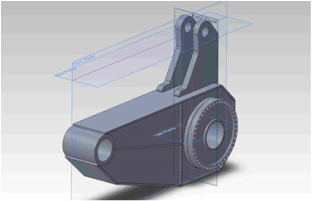 Additional capstone projects incorporating case studies and SOLIDWORKS® 3-D Training prepare students to sit for the SOLIDWORKS® Associate-Academic (CSWA-Academic) Certification. This course is designed specifically for students currently participating in the Advanced Applied STEM Academy Initiative at Northside High School. Students are better prepared for post-secondary success because they have identified their strongest skill set and pathway. Even students who do not plan to pursue engineering after high school have highly transferable problem-solving, communication and collaboration skills that are relevant for any career or coursework. Students will need to complete Foundations A and B with a C or higher before moving on to this course. Student teams will combine 3D modeling with research on guitar components to﻿ design a custom body, headstock, and tuners to secure a contract with a rock band. 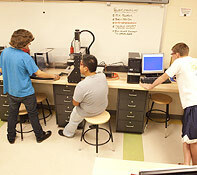 Students will then take their designs through the manufacturing process to develop a prototype for their presentation. This course focuses on engineering graphics introducing the student to symbol libraries, industry standards, and sectioning techniques. Topics include coordinate systems, principles of machine processes and gearing, and the construction of 3-D wire frame models using CAD. 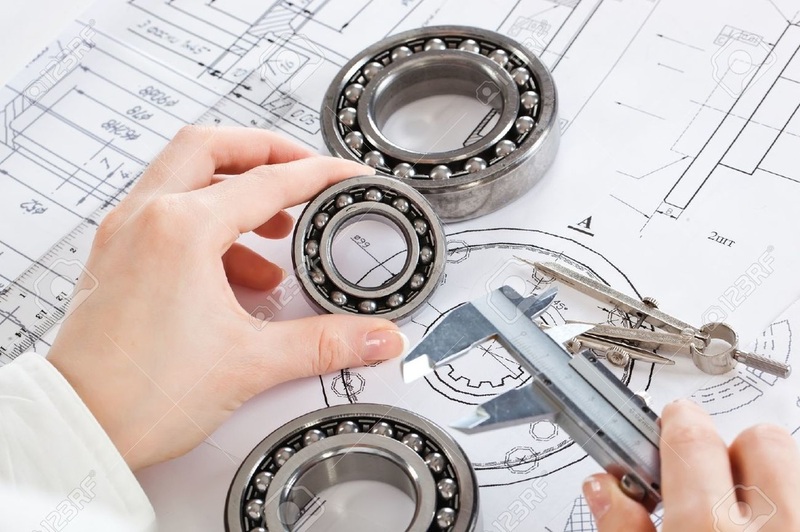 Mathematics, science, and mechanical engineering concepts involving the working principles and design of cams and gears are reinforced in this course. Work-based learning strategies appropriate for this course are apprenticeship, internships, and cooperative education. Hands-on work experiences and SkillsUSA leadership activities provide many opportunities to enhance classroom instruction and career development.